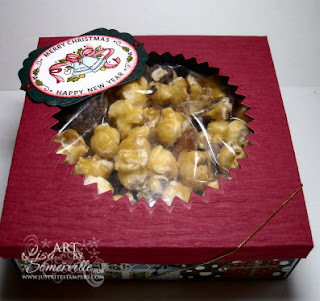 I love to create little boxes for gift giving. I created this cute little box for my mail carrier. I used Brawny RC 100 in Emerald Green from Paper Temptress for my box bottom (8" x 8" piece scored at 1-1/2" on all sides), layering Basic Grey Figgy Pudding Pattern Paper on Neenah SuperSmooth Blue card stock. For the lid, I used a piece RedCrepe card stock (6" x 6" scored all sides at 7/16), then using the Spellbinder Large Pinking Circles cut an opening in the center. Once the box was assembled I cut a piece of acetate to place inside the lid. To fill my box, I bought some Dark Chocolate Drizzle Caramel Clusters from Target. 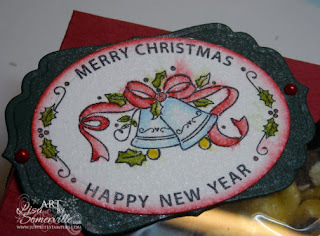 To create the tag, I used the JustRite Christmas Joy Borders & Centers and Small Oval Stamper, stamping my image in Black Archival on Watercolor paper, then coloring using the Marker Watercoloing Technique. Once dry, I used Spellbinder Oval Dies to cut the oval, edge the card stock in Ruby Red. I used Spellbinders Label Four to cut a panel from the Emerald Green card stock, then layered my stamped oval. I lightly spritzed the tag with Pearl Glimmer Mist (slightly causing my Red coloring to run), adhered a few Red Kaiser Pearls and attached to my box. Below is a link to the pattern I created for the Box - finished size is 5" x 5". I'm trying a new method for adding documents, so it it doesn't load and you need a visual, just use the email me button on my sidebar to contact me. Just Right! lol, the template downloads great in this program, thanks. Very nice!! Looks so yummy!